The impact analytics and big data on the healthcare industry is an epitome of how new age technology is changing the world as we know it. The benefits that analytics offer to the healthcare sector are numerous. 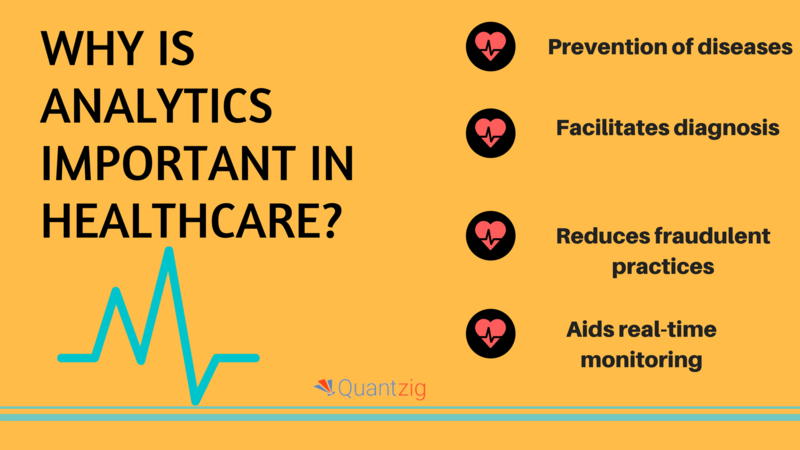 Some of the well-known advantages of analytics in the healthcare industry include reduced price, higher profits, and improved quality of life. Large amounts of heterogeneous medical data have become readily available in various companies in the healthcare industry. This data could be used for deriving insights, improving care delivery, and reducing waste. The enormity and complexity of these datasets present significant challenges in analysis and subsequent applications to a practical clinical environment. Analytics help companies in the healthcare industry to organize this data and leverage them to derive meaningful insights. There is increasing awareness among the general public on fitness and well-being. This has fueled the market for gadgets like wearable tech which will help consumers easily keep tabs on their health without having to undergo regular medical checkups. Recent studies have shown that the use of wearable tech helps to increase patient engagement by enabling them to keep track of their daily regime. Also, several top companies in the healthcare industry vouch for the fact that there has been a considerable positive ROI through big data analytics. To stay profitable in the long run, companies in the healthcare industry need to tweak their business plans to include big data and analytics in their long-term growth strategies by leveraging apps and wearable tech markets. With the help of analytics, it becomes easier to analyze large volumes of healthcare data created on a daily basis and derive essential insights about the ailments which would otherwise prove impossible to predict. In fact, doctors will soon be making use of analytics to know the complete history of their patients, thus administering better treatments at a micro level. At a macro scale, access to a vast pool of national healthcare data will aid governments to spot epidemics and outbreaks, hence developing coping strategies in advance. Fraud and abuse can lead to rising costs in the healthcare industry. Common frauds can be in the form of multiple prescriptions being issued in the same person’s name, patients receiving treatment from numerous hospitals simultaneously, etc. Analytics helps to safeguard companies in the healthcare industry from such abuse by using predictive analytics to detect exceptions and patterns. Once these patterns are identified, healthcare industry players can take preventive action and save themselves from massive losses. Analytics proves handy to monitor in real-time the health of patients. Doctors can be notified of any sudden fluctuations in the patient’s conditions to help them respond to emergencies and take crucial life-saving decisions faster. Also, advanced wearable tech can detect any future hospitalization requirements even before the doctors realize the need for the same. For instance, For example, the weight of the patients suffering from obstructive heart disease can be tracked to detect fluid retention. This will help identify the need to visit the hospital for check-ups.